Chickpeas were just featured on Dr. Oz as one of the cheapest and most nutritious foods you can eat. I am sure that when Toll House hears about this - they will start including chickpeas in their famous chocolate chip cookie recipe. This crazy dip concept was sent to me by Julie, who saw it (with much better photos than mine) on papillon. 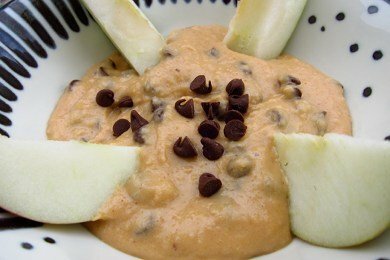 This is vegan cookie dough dip - no butter or eggs are used to make this work. This also involves just one bowl (your food processor) and zero cooking. There is 1/2 cup of sugar in this recipe (or it wouldn't work) and it boils down to about 1 teaspoon of sugar per serving (1 tablespoon) - which I realize is not a healthy amount. Keep this cookie dough dip in the TREAT category. Keep in mind that if you compare it to regular cookie dough (with the butter and eggs) you are doing much better in terms of saturated fat intake with this dip. What do you think of cookie dough dip? Could you use the Splenda/brown sugar mix or just straight Splenda for this to take the calorie count down a bit? @JR Sure, give it a try! The calories are also coming from the peanut butter (hard to substitute for that). How about using PB2 in place of the peanut butter? I noticed the original recipe called for 1/4 tsp of baking soda...anyone know why? I realize that the salt would bring out the flavours more, but is not necessary, but I am curious about the baking soda? Wow very good! The kids liked it:-) Do you think it is a baked cookie when it has the baking soda in it? you guys are mind readers cause as I was reading the recipe I was thinking splenda and PB2 with chocolate, I may have to try this and see if it works, bet it would. Snack Girl, you should totally make raw vegan cookie dough balls. They're naturally sweetened, delicious (really does taste like cookie dough), and is no bake. I was wondering if stevia would work or if this is a recipe that requires the volume of sugar/splenda. Also would another nit butter work like almond or sunflower? This looks very promising! Great recipe! I tried this today and both my daughters (7 and 9) loved it! My wife and share their sentiment! Thanks for sharing the recipe! I saw nothing wrong with Scott's comment!! Anyway, I'm going to try this recipe this weekend! Hi, I'm Anna from papillon; I only just realised this had been featured here! ^__^ Very happy you liked it. In response to LW: I included baking soda in the original recipe for flavour, like the salt; it's just more like cookie dough and brings the flavours together. But it's totally not required if you wanted to leave it out, cause obviously you don't need it as a raising agent. Thank you Anna for your response! I'll try it both ways. Did anyone ever try it with PB2? I'm wondering how it tasted and what the amount used was! I tried this recipe! Tasty! I will be honest, I thought this was going to be one of those crazy vegan recipes posted by someone who has not had real food in so long they find totally unacceptable food to be 5 star worthy... but I was too intrigued to not try it. I think it is AMAZING. My husband LOVES it. (which surprised me) One of my kids hates it, one kind of likes it, one likes it, and one is still just on breastmilk. ;-) I think it's amazing though. You can do 1/3 cup of sugar and it works out just fine, fyi. Makes me feel a little healthier... I am seriously adddicted to this stuff. I tried it with 4 Tb. of chocolate PB2 in place of peanut butter and using Splenda Brown Sugar Blend, and it is terrific! OMG! What a wonderful surprise! The chickpea combo rock! I have very little guilt letting my kids gorge on this. Ok, who am I kidding? I'm the one gorging on this. YUM!!! This did nooot work for me at all- I tried to sub in splenda which I think was a bad move... great idea though, I'll have to try it with sugar! This looks awesome, but I'm allergic to nuts (peanuts as well as tree nuts)! Can anyone suggest a similar substitute? can this be made using another bean instead of chickpeas? Great northern or garbanzo, white kidney beans?? thank you and can't wait to try it! @Paula - I don't think it would work with other beans. There is a perfect consistency with chickpeas. Give it a try and let us know!! does it taste much different if I used regular white sugar? Has anyone tried making this with another kind of nut butter? We have peanut allergies is the house, so wondering if this would be good with sunbutter or cashew or some other. You can't really taste the PB in this recipe, I think it adds a little something but it is not an overwhelming something if that makes any sense. Another butter should work but I'd go with cashew if there is a peanut safe one - but only because I don't like sunflower butter. If you've ever made cookies with either of those two things and liked them, I would let that be the determining factor. Obviously taste is a matter of personal preference. Texture wise, it should be the same.